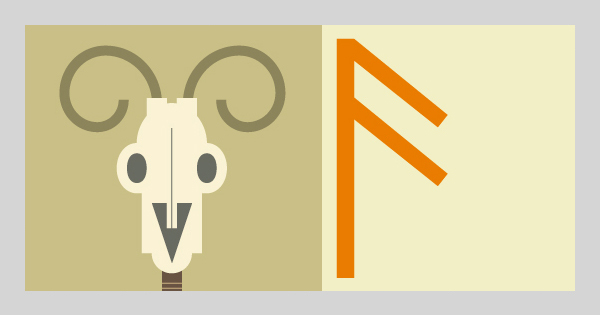 Inspired by the BBC documentary The Viking Sagas I started some basic research into Norse mythology with the intention to produce two or three illustrations. There are two key Icelandic manuscripts that contain the oldest written records of Norse mythology. These works are The Younger or Prose Edda and The Elder or Poetic Edda . I’ve concentrated on The Poetic Edda , a collection of Old Norse poems dating back to the Viking Age and collected later in the manuscript Codex Regius. I’m producing illustrations for Ljóðatal, a poem from the Hávamál section of The Poetic Edda. The poem is an account of the god Odin’s eighteen magical songs. The scope of the project is far broader than I originally intended and will now likely require twenty or more illustrations. There is some scholarly debate around the manuscript and particularly this poem. Much of this debate centers around the authenticity and interpretation of the source material. My thanks to Professor John McKinnell for taking the time to respond to my questions and for his invaluable article that helped me to understand the debate more clearly. Wisdom from the Dead: the Ljóðatal section of Hávamál informed my stance on the poem and is linked below. I have based my text on a translation by Benjamin Thorpe. This translation is one of the more faithful to the original structure and wording of the poem. The father of the gods, Odin is obsessed with aquiring arcane knowledge. He has previously given up an eye in exchange for a chance to make use of Mimir’s well of knowledge. At the start of the poem one-eyed Odin hangs on the tree, Yggdrasill. He stabs himself with his spear, sacrificing himself to himself. Now dead and in the underworld he aquires knowledge of nine songs (charms or spells) from a giant, his unnamed maternal uncle. Odin is re-born, wiser and inspired. He is able to create a new song from each of the nine taught to him. A stanza is then dedicated to a desciption of the powerful magical effects of each song. McKinnell, John. 2007. ‘Wisdom from the Dead: the Ljóðatal section of Hávamál’. Medium Ævum 76: 85-115.